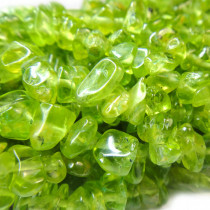 Peridot is a rare type of Olivine and one of the few gemstones that occurs in only one colour, green. 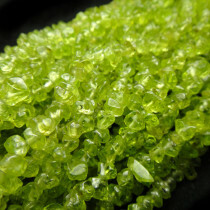 The intensity of the green depends on how much iron is contained in the crystal structure. The most treasured colour is a dark olive-green. 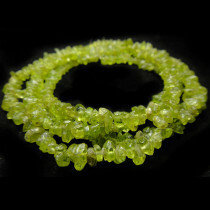 Peridot is sometimes mistaken for emeralds and was even called "Evening Emerald" by the ancient Romans. 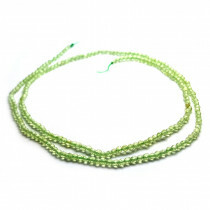 Peridot Gemstone Drop Style Chips (~100pce Strand) - 40cm/16'" Strand. 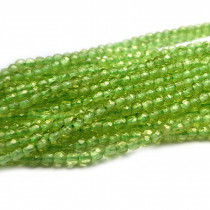 Peridot Gemstone Chips 3x5mm (~250pce Strand) - 91cm/36'" Strand. 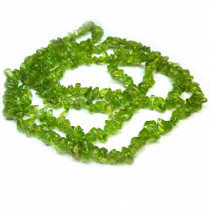 Peridot Gemstone Chips 4x6mm (~200pce Strand) - 91cm/36'" Strand. 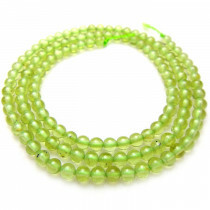 Peridot Natural Gemstone Round 3mm Beads (133pce Strand) - 40cm/16'" Strand. 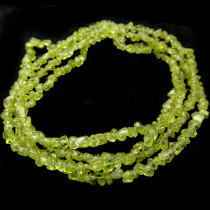 Peridot Gemstone Chips 5x8mm (~180pce Strand) - 91cm/36'" Strand. 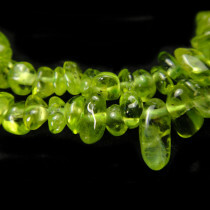 Natural Peridot 2mm Faceted Round Gemstone Beads (~200 pce Strand) ~40cm/16'" Strand.